Over recent months my occasional pizza feast has become twice weekly. That’s because since switching to a pretty much vegetarian diet I’ve come to really appreciate that pizza is one of those treats that doesn’t need meat. 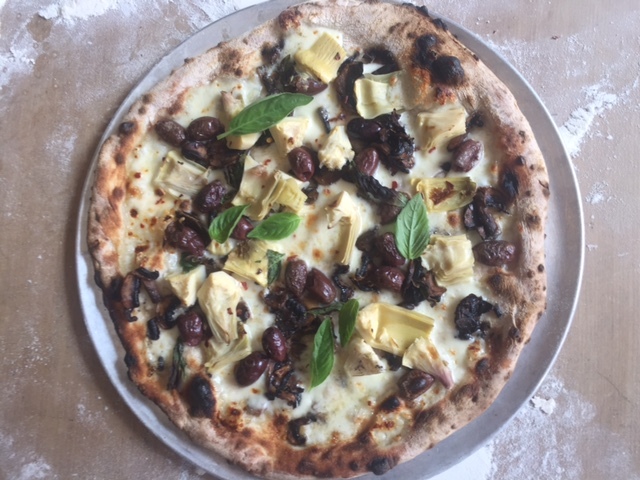 Give me plenty of cheese and toppings like olives, artichokes, mushrooms and eggplant and I’ll choose pizza over a meaty meal any day. Don’t worry, I’m not trying to convince you here to ditch the salami or prosciutto from your pizzas. Instead I want to share my recipe and technique for making pizza dough at home. Luckily for me my husband does most of the heavy lifting and I get to enjoy the fun bit of adding the toppings and eating the pizza. Until recently my go-to tool for getting (close to) restaurant pizzas at home was a ceramic pizza stone – you’ve probably seen them or perhaps you own one. But this changed with the recent arrival of my baking steel. I saw a fellow blogger’s glowing review of using a steel for home-made pizza and I had to have one. The baking steel works like a stone but it’s rectangular and is made from carbon steel – so it absorbs more heat and releases it faster than a stone. Finally I’m able to gloat about achieving a delicious airy Naples style crust at home. I purchased my steel from a company called ROC Baking Steel. I like that their products are designed and made locally in Australia and their 60 day money back guarantee won me over. I’ll share photos of my baking steel pizzas soon but in the meantime the dough and pizza you see here is the result of my hard work during a pizza cooking class at Fratelli Fresh in Sydney. 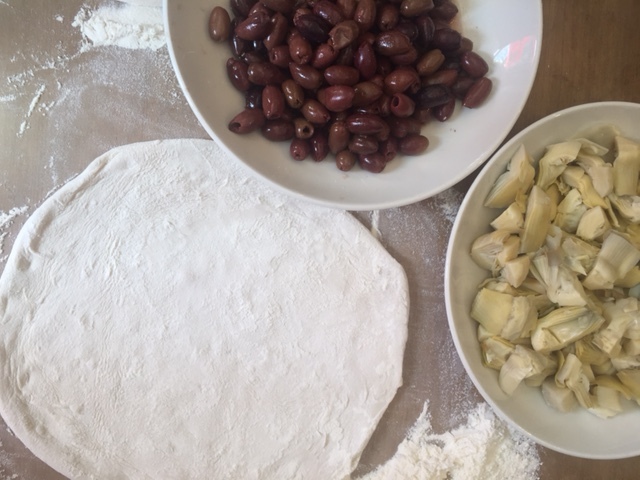 This takes me to my second tip – before you dive into making pizza dough take a class with a professional. Or at least pick the brains of the pizzaiolo at your local pizzeria. Many of the tips I learnt during my recent class have been added to this post. Place the yeast in the water and dissolve it using your fingers. Mix the flour and salt in a bowl, then tip the flour mixture onto a clean work surface. Create a well in the middle. Put a little of the water mixture into the well and slowly combine the flour and water. Gradually add more water until everything comes together into a moist and sticky dough. How sticky? Not so that chunks stick to your hands. If it’s too moist add flour. Add a splash of olive oil to the dough then lightly flour a clean surface and knead the dough with the base of your palm. A few minutes of kneading is usually enough to reach the ideal spongy and light texture. Divide the dough into four balls of the same weight. Lightly knead each one to a uniform shape and pop into an airtight container that’s been greased with a little olive oil. To prove the dough store it at a temperature of 9 to 10 degrees for between six hours and two days. If you’re proving the dough for over 24 hours then the first part of this proving time can be in the fridge. Bring the dough to room temperature a couple of hours before you’re ready to roll. 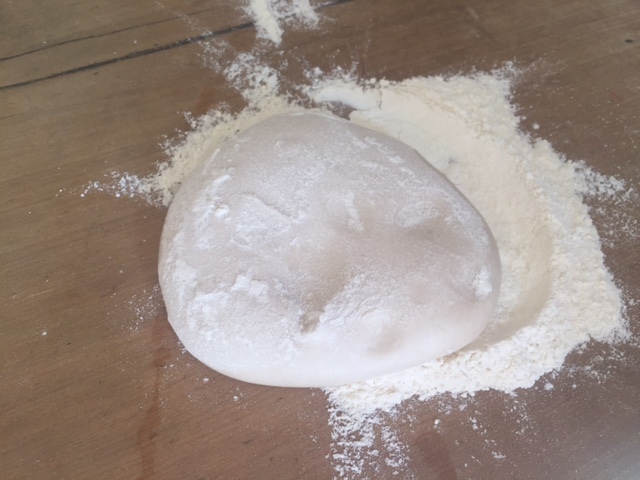 Using your hands (rather than a rolling-pin) turn your dough ball into a flat round pizza base. Through this technique you should end up with a slightly raised edge – and this will make a perfect crust – something that’s hard to achieve if you resort to a rolling-pin. Of course you can also check out You Tube for ‘how to’ videos on turning dough balls into pizza bases. 30 minutes or so before you want to cook the pizza pre-heat your oven to the maximum temperature with the pizza stone or baking steel inside on the highest shelf. Don’t assume the fan setting will be the most powerful – on my oven the conventional setting is the hottest. Transfer the pizza base to a wooden board that’s been sprinkled with semolina. The semolina is great at preventing the dough from sticking. But you can also use a good sprinkle of flour. Add your pizza toppings. Be quick here especially with a tomato based pizza – leave it sit too long before cooking and the dough can become soggy. Before opening the oven check your topped pizza can slide on the board. Then quickly but carefully transfer (or slide) your pizza from the board onto the pre-heated pizza stone or baking steel. Cook the pizza for 4-6 minutes – keep a close on eye on it from 3 minutes and avoid opening the oven until it’s ready. Remove your pizza from the oven and add any finishing touches like fresh basil and a good drizzle of olive oil. If you have any questions on this technique or suggestions on how I can make it any better let me know…..oh and what’s on my white based pizza here? 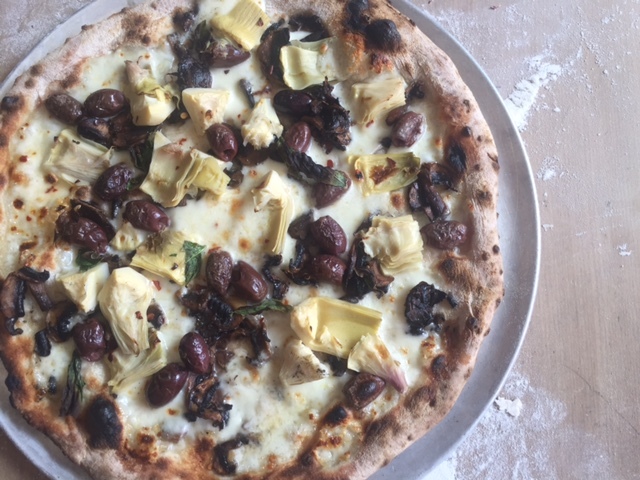 Mozzarella, artichokes, mushrooms, chilli flakes and scamorza – a smoked Italian cheese. Deliciozo! I’m sharing this post as part of Fiesta Friday #163 hosted by Angie, who founded the weekly virtual gathering over three years ago. Hopefully I’m inspire my fellow foodies into a pizza packed party! Tags: at home, dough, how to, pizza, recipe. Bookmark the permalink. We use a stone, but this Pizza looks amazing. Thank you for this wonderful informative post, I’ve pinned it and will also look into that pizza baking steel. I wonder if they sell them in the US? Hi Liz, I’m sure you’ll be able to get hold of one in the US – unlike stones that can break the steels should last a lifetime! induction plate and even as a cold plate after its been frozen^Pre-seasoned. Does that sound like the same thing??? Can also be used as a griddle? Oh my! Hi Liz – that sounds like the same thing – perhaps check out the reviews and also compare photos to those on the Australian site that I shared too. Also note on arrival we had to prepare the steel with coconut oil – so check out any finer details too! I will, it sounds very interesting (as if I need anything more for my kitchen though). I am trying (unsuccessfully) to down size. Maybe I will get rid of the pizza stones? Yes Liz my stones are going now – trying to get rid of kitchen clutter too! Laura, I love this post! I had the best pizza I’ve ever eaten in Naples so the thought of being able to recreate it at home. Will have to investigate the baking steel so that I can get that “Naples-style crust”. 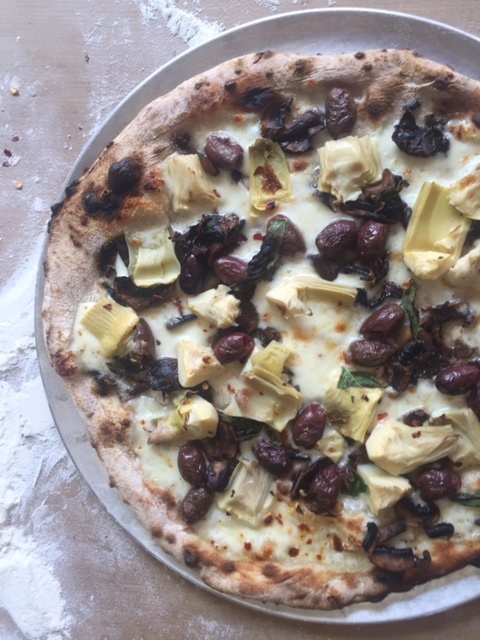 Also love your combination for the toppings – aubergine and artichokes are two of my favourite things to eat. Lovely feedback Tracey – thank you – yes check out the steel – the photos here are from a wood fired oven class I attended but my results so far with the steel have been fantastic – I’ll share photos soon! Thanks so much Tracey – that’s lovely to hear, I’ll check out your post! 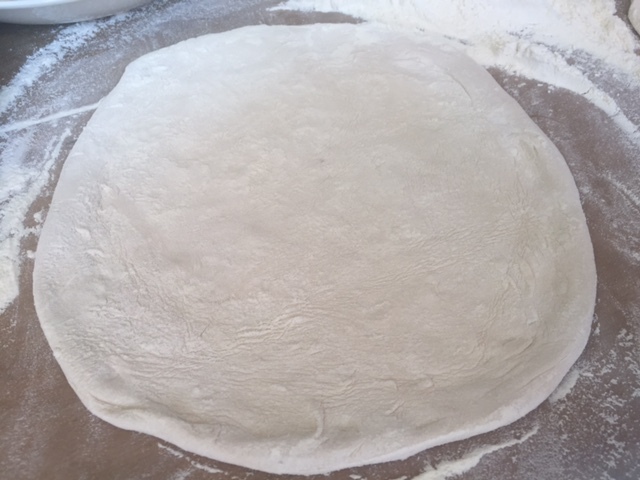 Your dough looks perfect, so smooth 🙂 I’ve never used 00 flour, maybe I need to try it..
Hi Elaine – yes 00 flour is the traditional one for pizza. At home we usually use a blend of 00 and spelt or stone milled wholemeal – and it still works really well…. This pizza looks delicious! I love to make homemade pizza, and I will have to keep this dough recipe in mind. I have a pizza stone (which I love) but have not tried a baking steel before. Sounds intriguing! Thanks Jenny – good to hear from a fellow pizza fan, and yes give this recipe a go on your stone – I’m sure it will work a treat! I love pizza – probably my favorite comfort food. You can buy the steel from King Arthur Flour. I have an old seasoned stone and decided I did not need the steel as I don’t make homemade that often. I am interest with that baking steel! The pizza looks amazing, Laura! Thanks Jhuls and yes check out the baking steel! I’m intrigued by the baking steel. I got a super cheap pizza stone and love it, when I remember to use it. More often than not it’s just a preheated thick baking sheet! My favourite veggie topping has to be courgette. So, so good! I’m sold, I’ll be buying some baking steel – I lost my pizza stone in the move a few months ago and haven’t got round to replacing it so I’m glad I’ve read this before ordering a new one! That’s great to hear Kay keep me posted if you need any tips. My top one would be topping the pizza dough on a wooden board sprinkled with lots of semolina. It should then slide nicely and smoothly onto the hot steel! Ah yes, I’ve been using semolina flour for some time. My main issue revolves around getting the base thin enough without tearing it. Oh, and keeping it thin, it’s quite elastic I find, so I’ll stretch it out, only for it to bounce back, seconds later! Yes a hole free base can sometimes be a challenge Kay – hands can often work better than a rolling pin….